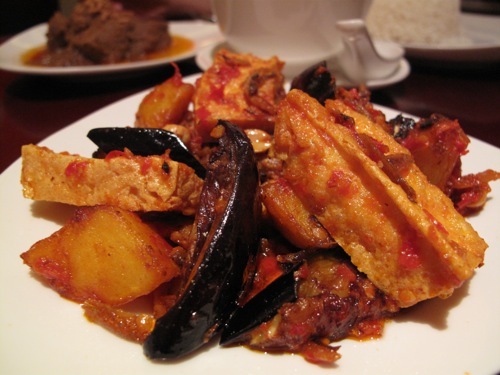 I was a bit surprised when I found out that Mawar, one London’s more popular Malaysian eateries was closing down after more than 30 years in its Edgware Road home. I have many a fond memory of Mawar from my uni days, often the de facto venue for Imperial College Malaysian Society events and ad-hoc meals after a night of sport at the nearby Wilson House. Mind you, the food wasn’t exactly mind-blowing and the no-frills venue was never the prettiest of places… but the Nasi Campur and Teh Tarik offered the familiar creature comforts a Malaysian-away-from-home needed every once in a while. Gone though are the buffet-style food warmers where you could once pick a selection of the day’s specials to accompany your rice. In its place, a new-look Melur which is a more up-scale, sit-down-dinner-type-of-affair. 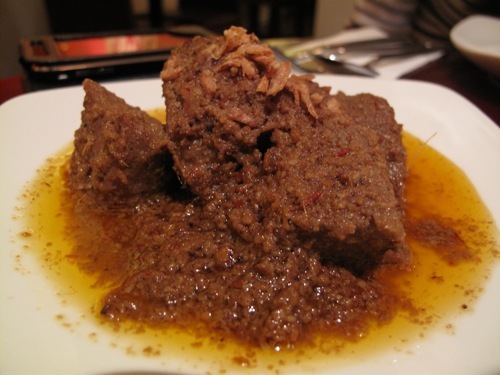 For me, the acid-test to gauge the pedigree of any Malaysian Restaurant is through the quality of its Beef Rendang. Here’s how I thought Melur’s version fared. The good: its great balance of spicy-sweet heat and coconutty richness. The bad: the tough meat could have done with hours more slow-braising. And the ugly: the measly portion size swimming over a vat of oil. In essence though, the flavours were all there. Small portion and tough meat aside, all the Rendang needed to pull it through was a fragrant Nasi Lemak (Malaysia’s national staple of Coconut and Pandanus flavoured rice) to accompany it. However, judging from the blandness of the rice, someone must have forgotten entirely about the lemak in my nasi – there wasn’t the faintest hint of coconut or pandan at all. It was refreshing though to see Sup Kambing (“Spicy Mutton Soup”) on Melur’s menu. Although commonly found in your bog standard “Mamak” stall in Malaysia, I’ve never come across this Indian-Muslim speciality in London before. 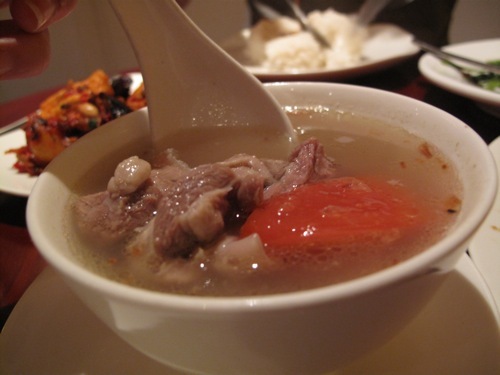 But in spite of the Mutton ribs, tomatoes and carrots throughout the broth, it lacked that spicy-peppery kick and nourishing depth of flavour that makes the dish. Surprisingly, it was the Vegetable dish and Condiments we ordered that night which proved the better bets. Melur’s Sambal Goreng, an eclectic mix of Aubergine, Deep-fried beancurd, Potatoes and Anchovies in a red hot chilly “Sambal” paste was an absolute treat… crispy, sweet, savoury and mightily spicy, it was exactly as it should be. 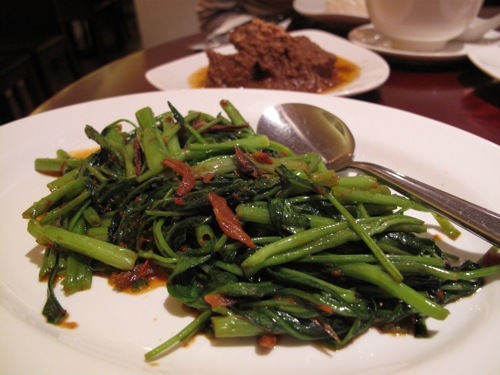 Kangkung Belacan (Water Convololus stir-fried with Dried Shrimp paste and Chillies) was also extremely decent. Fresh, crunchy stalks and juicy convololus leaves in a robust belacan paste that was punchy without being over-powering. The menu here is pretty extensive, and in addition to the wide variety of traditional Malay and “Mamak” specialities, one-dish street food classics like Assam Laksa, Char Koay Teow and Mee Mamak Goreng are also available. The damage wasn’t too bad – just over 30 quid in total for the 2 of us. However, given the food was a little hit-and-miss, I don’t think it warrants a return visit anytime soon. It was never going to be easy for Melur to fill an old favourite’s shoes like Mawar’s. Plus there’s always Sedap and MalaysiaKopitiam to contend with where you pay less for better food.